New age jazz drifted through unseen speakers as Will Humphreys-Cloutier and Ulysses Walters wandered around a condo at 3354 20th Street on Saturday. The condo was impeccable and bright; abstract art from local artists covered the walls. It was the end of Saturday’s 2 to 4 p.m. open house. With daylight gone, the light outside was quickly waning, creating a warm sensation from the lights and precisely staged furniture. Relaxing? Not a chance. Although some realtors say the market has slowed recently – it generally does as the holidays come closer – sales have been so heated that realtors now talk about buyer’s fatigue, but the tech money means they still show up. Humphreys-Cloutier, 22 and Walters, 28, are two. The company Humphreys-Cloutier works for was just acquired, so he figures now is the time to make a down payment on a place. “Right now, I basically have my notifications set on Redfin and Zillow, and I’ll scroll through once or twice a day just to get a pulse,” Humphreys-Cloutier said of his search, which he expects to go longer than those of some of his friends who were willing to put $1.3 million on the table for other condos and homes in the Mission. “We are more in the $800,000 range,” he said. For that, he doesn’t expect to get anything that he and his partner would want in the Mission. They currently rent a room in a three-bedroom apartment around the corner from the plush open house, which is far out of their reach. They love the neighborhood and want to stay but expect to have to extend their search. 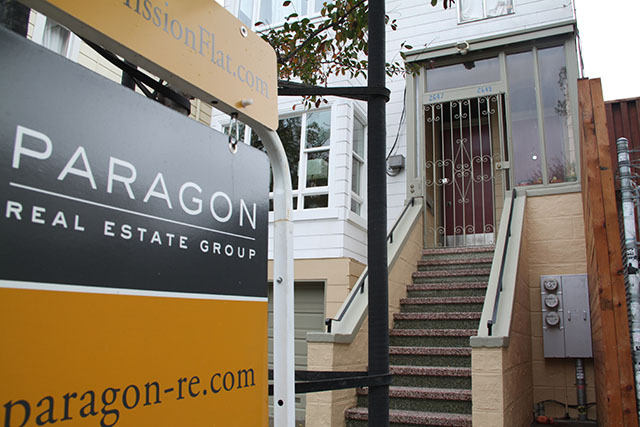 “There’s obviously a lot of tech money,” said Maggie Visser, a realtor with Paragon Real Estate Group, who was helping show a downstairs 2 bedroom, 1 bath unit at 2647 Folsom Street (2,302 square feet; $695,000) on Saturday afternoon. 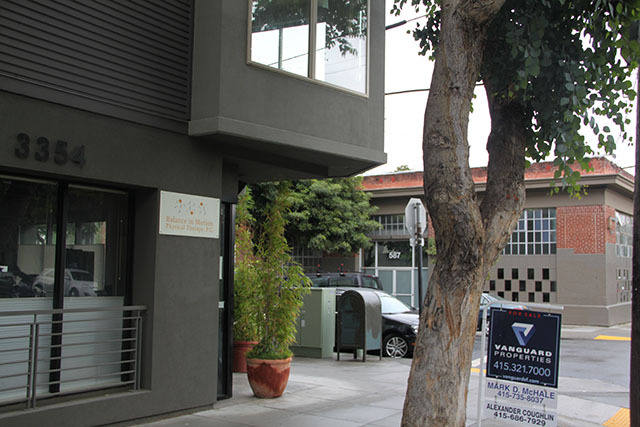 Seven blocks away at the five-year-old development at 20th and Bryant, John Beeney, also with Paragon, was showing a 1,328 square foot condo with two bedrooms and two bathrooms priced at $1.195 million. It was Beeney’s second weekend of open houses for the property, and he expected to start taking offers on Monday. Beeney anticipates the place to go for decently over asking – most properties do. “Things are still going over almost always,” he said. However, he too senses a buyer’s fatigue. “It bas become brutal. A lot of my buyers are like, ‘You know what, we have to take a break,’” he continued. Just as he’s explaining this, a young woman blows through the front door with her mom in tow. She has short hair, thick black-framed glasses, and is wearing a cotton green tee and jeans. She immediately points to part of the ceiling and asks why it feels low. Karen Chang, the young woman, has just moved from New York to work at Pure Storage, a start-up headquartered in Mountain View, and wants to buy a place in San Francisco. She moved from the East Coast for the slower pace of life – one she hasn’t found in the housing market, she said. “I think it’s more frenzied in San Francisco than New York. There’s less supply and more demand,” she said, while her mother continued to look around and ask pointed questions about heating and garbage. While there is constant debate over whether New York or San Francisco is a more difficult market for buyers, few argue with the Mission’s position in the market. “The Mission is hot. That’s the bottom line. It’s a very hot neighborhood to purchase in right now. If it’s well priced, you well probably get 6 or 7 offers. Not the 3 or 4 you will get in other areas,” said Betty Taisch, president of San Francisco Association of Realtors. Taisch said there were seven open houses in the Mission this weekend. This is compared to adjacent SoMa’s three and Noe Valley’s five. “Not everyone can afford to live in the Mission, so they are going to Potrero Hill,” Visser said on Saturday. She thinks the interest in the South East neighborhoods will only get stronger because buyers want the nice weather and easy access to freeways and public transportation. Many also want to be near the restaurants and entertainment that the Mission continues to offer. “I am seeing mostly people like her: young, in tech or tech-related jobs. There are a lot of people who are being transferred,” Beeney said after Chang and her mom left for the next place. Realtors agree that tech workers tend to use similar strategies when competing for a place: cash. Often, they will forgo many inspection contingencies that could slow down the process. In an environment like this, decent properties go for well above asking and what would normally be less desirable properties still go over, according to Beeney, who has been working in San Francisco real estate for over 20 years. The competition has started to get to Derek and Jeanine Sanders who only started looking to buy two months ago. On Saturday, they were out with their realtor to continue to scout properties and had arrived at the 2 bedroom, 1 bath 2647 Folsom early. Jeanine works as nurse in the Castro, and Derek runs a recruiting company downtown, so the Mission would be a central location for them, but the young couple has decided to expand their search to Oakland. There, they said, they might at least get a yard and parking space . “It’s seriously over priced, and at some point, you reach your limit and you refuse to pay to live in a shoe box,” Jeanine said. NextGood Morning Mission! A Gray Morning in La Mision! The first couple is a prime example that the American dream is still alive. Only 22 and 28 and able to afford a $800,000 home. Shows you that hard work pays off. Kudos to them. Its great that a young couple can buy a house, but I wouldn’t assume that “hard work” is how they’re able to do it. All we know about them are their ages. A dream that is not attainable to 99% of the American population (maybe 95% of the San Francisco population). When it all crashes, it will crash hard. How can it be an inflated price if someone paid for it? I think a $30 burger is ridiculous on Valencia. Yet they have a line out the door and “sold out” by 8pm. Something is only worth what someone will pay for it. $30 burger on Valencia St.? Where? I am not in the market for that type of ground beef but I can’t think of what restaurant is selling it either. Too bad they did not “get here first” and get segregated 1 st. class status as rent controlled tenants. Then they could live for cheap on the backs of 2nd class status renters, without rent control, who must pay way more, because the rental market is contrived into a 2 class unfair scheme. Who needs to buy and own, when you can steal property with rent control ?